Three Japanese midget submarines made a surprise attack in Sydney Harbor on the night of May 31 and June 1, 1942. Only one midget submarine fired its torpedoes, with one sinking the Australian depot ship Kuttabul after barely missing the heavy cruiser USS Chicago (CA-29). All six crewmen, two each on the three midget submarines, lost their lives, and 21 sailors were killed in the sinking of Kuttabul. 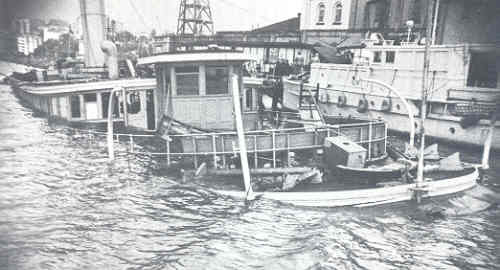 Rear Admiral Muirhead-Gould, top Navy official in charge of harbor security, prepared an official report on the attack. However, Australia Under Siege points out several errors and shortcomings in this version of the midget submarine attack. This seminal book is the first one to question critically the official story by interviews with battle participants, examination of various naval and government documents, and review of the Japanese version of the attack. After publication of the book, it influenced several other researchers to further examine the events to try to piece together what most likely happened. Many of the facts in this book have never before been published. They were gained only with great difficulty from the still cautious survivors of the raid and by arduous battles with the even more cautious custodians of public records. 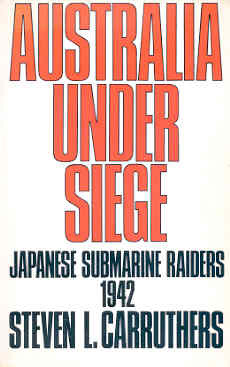 It is an indication of how officially unresolved the history of the Japanese midget submarine is, that several of the Australian survivors of the raid were reluctant to confide historical and military facts for fear of losing their pensions or worse, being prosecuted under the Official Secrets Act. The attitude of these men is a product of the quite unjustified fear of being considered unpatriotic . . . a feeling that was nurtured by the closed and fearful attitudes of censorship instigated by the Curtin government. Chapters 1 and 2 tell with the story of the midget submarine attack starting with the Japanese reconnaissance flight of Susumu Ito over Sydney Harbor two days prior to the scheduled attack date, but the narrative gets interrupted and does not finish until Chapters 9 to 12. The chapters in between provide background for the attack, but Carruthers gets off into some topics that seem more of a digression than information needed to understand the Japanese attack. These include Australia's constitutional problem of declaring war and the issues caused by the influx of American soldiers and sailors into Sydney after the start of the Pacific War. The key role of Lieutenant Keiu Matsuo in the Sydney midget submarine attack gets highlighted in this book. He graduated from Etajima Naval Academy, was selected to train for midget submarines, and later was transferred to the staff of Fleet Admiral Isoroku Yamamoto. He went to Pearl Harbor as a spy prior to the attack in order to examine the naval base and harbor layout. After he reported his findings back in Japan, he went on submarine I-22, which carried one of the five midget submarines for the Pearl Harbor attack, in order to brief in detail the officer selected to lead the midget attack. About one month following the Pearl Harbor attack, Matsuo strongly argued to Yamamoto for continuation of the midget submarine program despite the loss of all five midgets at Pearl Harbor. Yamamoto somewhat reluctantly agreed to proceed with preparation for a second midget submarine attack and with structural modifications to the midget submarine such as construction of hatches so that the two crewmen could move to the midget while the mother submarine was submerged. Matsuo commanded the midget submarine attack at Sydney. After Matsuo's midget submarine had been rammed and had depth charges dropped on it when sighted near the harbor entrance, he exhibited great patience in waiting silently for several hours before he entered the harbor. During training when his midget submarine had become stuck on the sea bottom, he had demonstrated the same type of calmness as he waited with a fellow crewman for over four hours before a vessel on the surface sighted the air bubbles being released slowly from the stuck submarine. Carruthers criticizes Rear Admiral Muirhead-Gould both for his actions during the night of the Japanese midget submarine attack and for his official report that he prepared on the subject. He concludes that the report was based on Muirhead-Gould's own conclusions in order to shift blame away from him and onto others even though he had responsibility for the defenses at Sydney Harbor. Carruthers states, "His report was submitted to the Naval Board without any corroborative details from key naval personnel involved in the various incidents, and appeared to be a smokescreen to cover any embarrassing questions" (p. 133). Reginald Andrew, Captain of channel patrol boat HMAS Sea Mist that sank Matsuo's midget submarine, in a lengthy series of personal interviews provided Carruthers with what happened during the night of the midget submarine attack. Many details in his testimony conflicted with the official version of events, and Carruthers concludes that there was an official cover-up but the incident was not pursued since casualties from the attack were not heavy. Despite Carruthers' criticism of Muirhead-Gould's official report, he still uses some of its incorrect information in this book published in 1982. For example, he uses the inaccurate date of May 30 rather than May 29 for Susumu Ito's reconnaissance flight, and he uses the impossible times mentioned in the report to account for the movements of Captain Howard Bode of the heavy cruiser USS Chicago. Peter Grose's book entitled A Very Rude Awakening, published 25 years later in 2007, corrects many of these errors in Carruthers' 1982 book and represents the most thorough history of the Japanese midget submarine attack at Sydney Harbor. Grose received generous support from Carruthers, who provided him access to all tapes and files accumulated during 25 years of research. In addition, Carruthers published in 2006 a revised and expanded version of this 1982 book under the new title of Japanese Submarine Raiders 1942: A Maritime Mystery.